I guess that putting My Tiger My Timing on my “Best of 2009” list got me on their good side so now I’m lucky enough to get updates on their latest goings directly to my inbox. A couple of weeks ago they gave me a heads up that they had posted a demo of their new track “On My Record Player” on their SoundCloud site. If they’re able to crank out demos that sound this good, I can’t wait for any kind of full length that I’m guessing is currently in the works. 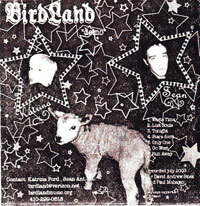 I picked up this cassette at the very first YoYo A GoGo in 1994 (wow, 15 years ago, amazing). It was the first time I had seen either band, but I was particularly impressed with Long Hind Legs at the festival. I’m not sure about the Kicking Giant track names since they are just listed as one song “Hotbox” on the cassette, but they are 4 distinct tracks, so I broke them up. If I was compiling my Top 10 list of the 2000’s, Celebration’s “The Modern Tribe” would be up there near the top. Even though I had heard earlier bands that were virtually the same line up (Jaks, Love Life), none of those have excited me quite like Celebration. I was bored, searching around the interwebs and finally came across someone who had posted the demo from their pre-Celebration/post-Love Life iteration, Birdland. Though not nearly as good as any of the 4ad releases, the tracks are still more innovative and thought out than any of their previous attempts. This was on Side 2 of a cassette that I had which had the His Name Is Alive “Riotousness & Postrophe” Demo. The HNIA “Early Music Vol 1.” which included that demo is from 1985-1989, so this must be Warren Defever pre-1985. I have absolutely no idea on the track listing. 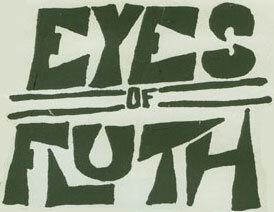 It’s a rare occasion when you can’t find anything about a band on the web, but that’s the case with Eyes Of Fluth. A Google search only comes up with one reference, which is something that I posted over at The Rapid City Punk Rock Archive (which, if you haven’t visited, it’s an amazing resource of late ’80s/early 90’s punk rock). I saw this Sioux Falls, SD band play live in 1990 and I distinctly remember them. Many years later, a friend of mine made me a copy of their demo. It’s a great example of late-80s punk rock when songs were simple, everyone played through Crate amps, and homemade 4-track demo cassettes were all the rage. Last week I got a request for the entire show that I had recorded of The Pulsars playing at Silverlake Lounge. In exchange I got a .zip file full of rare Pulsars tracks including this one. Apparently this was one of the demos from the lost record that was recorded but got lost in their major label scuffle. When I saw them at the Silverlake Lounge they mentioned they were only playing songs from their first released record, I’m curious if they played anything from the unreleased record when they played The Troubadour a month or so later. Besides their very first 7″, I never liked Cap’n Jazz. But everyone else that I know does, so here’s a post to satisfy the masses. I even gave their cover of “Take On Me” another listen last night thinking I might change my mind and now find it charming. Nope. I had a request for this post nearly a year ago and I’m finally getting around to converting this to CD. I try and post a live recording from my collection, but today I’m going with a demo instead. 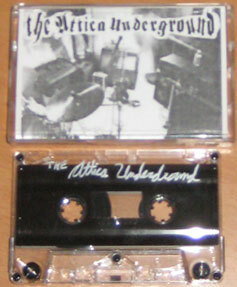 The Attica Underground put out one 7″ on Counterfeit Records in ’97, so I’m guessing that this demo was recorded in 1996. Members of this band ended up playing in The Book Of Dead Names, The Cardinal Sin, Cadillac Blindside, The Spirit of Versailles, and I’m sure many other bands that I can’t remember. As soon as I listened to the first track I remembered that china boy cymbal that Rebecca used to have because she uses it liberally on this recording. I constantly made fun of that thing, so when I heard it, I had to laugh. Besides that damn cymbal throughout the demo, it holds up pretty well. Especially the first song which I posted as the sample track. They seemed to forget to list the name of two of the tracks on the cover so I’ve listed them as “Unknown Track.” It could be that the cassette that I ended up with accidentally had one of the pages of the insert cut off. It seems that FischerSpooner are thumping around again. They have a few singles available on eMusic and appear to have an album coming soon. That is good news to these ears. 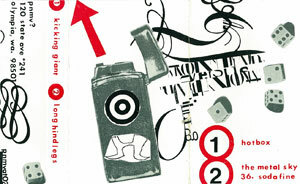 Back in 2000 they injected a much needed infusion of sophisticated humor into the indie rock scene via the electro-clash conduit. Their initial performances were avant-garde dance electro-trash pop happenings consisting of large stage set-ups, a gaggle of wicked Juilliard trained dancers but to (ahem) largely canned music. Their on-stage sense of theatrical flash, snarky humor, digs on pop music tropes and rock performance bravado were genius in my book but probably missed by anyone outside of New York. By and large the critics totally missed the point too, which I didn’t think possible. By the time their second album came out, they sadly dumped much of the avant-garde stage antics, ditched the post-modern lampoons, and performed as a proper straight-up rock outfit and toured the typical rock venue circuit. I certainly appreciated the “live” aspect but I have to ask; “Why not at least keep the dancers?”. 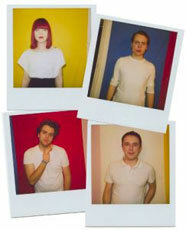 Dancing babes are sorely missed in indie-rock. Why does pop drivel purveyors like JT, Britney Spears, etc have a monopoly on dancers? FischerSpooner was able to resolve this decades-on dilemma and I, for one, was hoping that it would spread like wild-fire. This is a video clip of the 2005 high-camp live Halloween show they did that was a one-off return (albeit in reduced numbers) of the dancers. Also notable is that this song was co-written by the late great Susan Sontag right before she died. Since this clip is partial and camera work is spotty at best, mp3 is included. 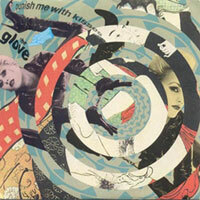 My absolute favorite of all The Cure re-releases has been Blue Sunshine by The Glove. As much as I like the tracks as they are, my favorite songs off the original were the ones sung by Robert Smith. So when the re-released disc came out, I was thrilled that they included not only “new” old songs, but also the demos that Robert sang on. This song was originally sung by Budgie’s (drummer of Siouxsie and The Creatures) girlfriend and former dancer, Jeanette Landray.